Apologies for the long interval between newsletters. Please note that the first three events are nearly upon us. Wally Dethlefs: "The Role of the Church: Yesterday, Today and the Future"
You are warmly invited to this talk by former Brisbane YCS chaplain Wally Dethlefs. 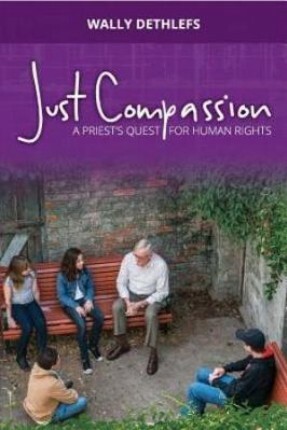 The event will include the Melbourne launch of his book 'Just Compassion: A Priest’s Quest for Human Rights’. Books will be available for purchase at the event. The Cardijn methodology and Twelve Steps programs were the foundations of Wally's various ministries among prisoners and homeless & disadvantaged young people, in education, and in establishing a welcoming parish. His tireless and successful work to redress the blatant lack of legal rights and community support for young offenders (and suspects) have been recognised nationally. Each year, the Cardijn Community hosts 'New Pentecost' events to remember Pope John XXIII’s call for Vatican II to lead to a New Pentecost for the Church and the world. This year, in solidarity with Cardijn Community International we have developed programs chosen to focus on the ecological challenges facing the world. Adelaide: at St Augustine’s church Salisbury, this coming Sunday 20th May, at 7 pm. The gathering, led by Joseph Delle-Nogare will consider Pope Francis’s encyclical Laudato Si using the See Judge Act methodology, and challenge attendees to consider the encyclical's application in their own daily lives. Melbourne: Staff Room, Catholic Regional College, 10 Theodore St, St Albans, next Thursday 24th May, at 7.30 pm. The gathering, on ‘Meeting the World’s Ecological Challenges: Let’s Start Local’, will hear from Katie Pahlow (Sustainability Victoria) Marilyn Bellett (Conservationist, YCW Worker) and Jade Gigacz (high school student, and member of the Young People for Development network). These short presentations will be followed by discussion on what steps we as individuals, as people of faith, and as local communities can take in response to today’s environmental challenges. A second meeting will be held to further consider the role of the proposed Cardijn Institute, and to approve and adopt rules for the proposed "non-distributing co-operative with share capital”. All welcome; copies of the minutes and draft rules are available to those interested. When: this coming Sunday 20th May, at 3 pm. With the assistance of YCW Holdings, Joe Magri and Elizabeth McFarlane of the AYCW have been successful in locatingYCW extension workers in Adelaide (Martin Delaney) and now Melbourne (Marilyn Bellett). Early signs of their efforts are very promising, and we wish Martin and Marilyn well and offer them all the support we can. Connections have been made with potentially interested CCA `members in Queensland and New South Wales. CCA's AGM was held at the Queen of Angels Church Hall, Thebarton, Adelaide, last October. A very full program included meetings with YCW and some very enthusiastic YCS members. Parish priest Fr Charles Gauci, a long-time YCW supporter, offered the use of the parish's beautiful old stone church as a CCA centre. The presidents report and financial report are attached. Minutes forthcoming to members. An anniversary Mass for the 50th anniversary of Cardijn’s death was celebrated in Perth in August 2017, very soon after the last newsletter was distributed. Some of the photos sent by Vicky Burrows are attached. In the wake of the Royal Commission these are difficult times for good priests. Actions taken as part of a CCA ‘Appreciate Your Local Priests’ campaign include the distribution of dozens of Wally’s Dethlef’s book to Melbourne diocesan priests. Past CCA president Guido Vogels reports that despair and suicide among the young in the Pilbara are all to prevalent. He has been appointed (on a handshake) by the Noongar-Martu and Nebula Elders of Newman, WA, to be the clinical director when the 28 bed AMHC centre opens in 2020-21. In the meantime he and Rosina have just moved to Newman, to get to know the Aboriginal people and develop programs for perpetrators of family violence, and training future workers. This is unpaid work until 2020, financed by some local counselling. SHAC, started by a parish CCA group in conjunction with the local community, has continued to make submissions to Councils and State government regarding homelessness, and is becoming better known and regarded. We have been invited by Frankston City Council to discuss ideas for crisis and transitional housing on surplus government land; models being considered range from mixed use developments with multiple stories, to our preferred lower density cabin park model. We also endeavour to stay in touch with community groups such as the local Unemployed Workers Union. CCA is working on a Catholic Social Services Victoria's planning committee for further ‘Parishes as Centres of Service' expos in Melbourne. One regional event is planned, and another two events will bring together parishes interested in specific issues: asylum seekers; and (new) parish environmental programs to implement Laudato Si. CCA offers its condolences to the families and friends of YCW, YCS and CCA leaders and supporters who have died recently. Those who have come to our notice are: Anthony Steel (Sydney ACU), Denis Sheehan (former YCW national chaplain, and AYCW mentor), Paul Willy (former Melbourne YCW Boys Chaplain, and AYCW mentor), and Fr Ernie Smith (Melbourne YCW diocesan leader, and founder of Sacred Heart Mission St Kilda). Very recently these good Cardijn formed people were joined by Leonard (Len) Faulkner (retired Archbishop of Adelaide, and retired Bishop of Townsville) whose episcopal ring was emblazoned with the YCW badge. He had loyally supported the YCW among Australian bishops in difficult times, and had been a supporter of CCA since its inception. Stefan Gigacz recently submitted his PhD thesis, supervised by Bruce Duncan CSsR, to the University of Divinity: "The Leaven in the Council. Joseph Cardijn and the Jocist Network at Vatican II". It provides a compelling new understandings of Vatican II. We look forward to its publication. David Moloney’s PhD candidature was approved in a recent University of Divinity confirmation panel. Supervisors are Rev Max Vodola and Katharine Massam, and the thesis working title is: "The YCW in Melbourne 1960 – 1993: Formation and Transformation”. Dr Race Mathews whose University of Divinity thesis (also supervised by Bruce Duncan) was published last year by Monash University Publishing as Of Labour and Liberty: Distributism in Victoria 1891 – 1966, is now available in the USA having recently been published by Notre Dame University Press. CCA Social Inquiries: Work on the Family Inquiry is proceeding, and draft Inquiries on ‘Homelessness’ and ’Seniors’ have been prepared for potential use in parishes. ‘Let’s Talk about West Papua’: information about talks being held around Australia can be found in a web search. We warmly invite new member-subscribers to CCA. Subscriptions: individuals $25; unwaged and pensioners $15; groups / families $50; parishes $100.